Time-sensitive networking (TSN) is an ethernet standard for transmitting time-sensitive data over ethernet networks. Use TSN to automatically synchronize acquisitions between systems across an ethernet network. The onboard 100 MHz oscillator of the TSN-supported chassis and devices automatically synchronizes to other network-synchronized devices that are part of your local 802.1AS subnet. The 80 MHz, 20 MHz, 100 kHz, 13.1072 MHz, 12.8 MHz, and 10 MHz Timebases are derived from this oscillator, and are synchronized to it. Therefore, they are also synchronized to other network-synchronized timebases on your 802.1AS subnet. This enables measurement signals to be synchronized to other devices across a distributed network. The TSN-enabled devices use the IEEE 802.1AS protocol over the network to synchronize. These devices cannot synchronize over the network with devices that use other protocols or IEEE 1588 profiles other than IEEE 802.1AS. Available Timebases may vary based on your device or chassis. Refer to your device documentation, available at ni.com/manuals, for more information. Ensure that your system includes at least two devices that support TSN. Refer to the Supported Hardware topic for more information. Line topology—Also known as daisy-chaining or bus topology. The host communicates directly with all nodes through one bus line. A standard Ethernet device or switch can be added to the end of the chain if desired and used as normal. Ring topology—The host communicates with all nodes through the most effective path. You must use an external switch in a ring topology. You must configure the network properly with a recommended external switch before creating redundant links in the network. Star topology—The host communicates directly with each node through the external switch. Redundant links are recommended, but optional, in this topology. You must use an external switch in a star topology. You must configure the network properly with a recommended external switch before creating redundant links in the network. 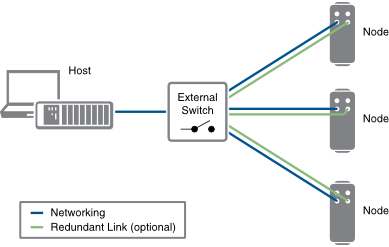 For network synchronization, star topology configuration requires an external 802.1AS switch. All the devices and switches on the network must be compliant with the IEEE 802.1AS protocol for synchronization to be enabled. Refer to your synchronization-supported device documentation, available at ni.com/manuals, for additional information on synchronization and networking for TSN. Ensure that synchronization is enabled by going to File»Preferences and checking Enable synchronization features for TSN devices on the DAQmx tab. When the TSN synchronization-supported devices in your system are properly connected and configured, and synchronization is enabled in FlexLogger, the SYNC display in the top taskbar should light green, indicating that synchronization is working properly. If they SYNC display isn't lit and green, refer to the TSN Synchronization Status topic for troubleshooting information.